4 stars for this quirky and unique coming of age film. Goats is based on the novel by Mark Poirier (Smart People, Hateship Loveship) and is the directorial debut of Christopher Neil. This is the story of Ellis Whitman (Graham Phillips - The Good Wife, Evan Almighty), a fourteen year old boy living with his unorthodox family in the foothills of Tucson. Ellis lives with his neurotic mother Wendy (Vera Farmiga - Source Code, The Departed) and Goat Man (David Duchovny - The X-Files, Californication), a local goat-herder who tends the family pool and garden (growing enormous amounts of marijuana on the side) and is, in return, allowed to live with them. 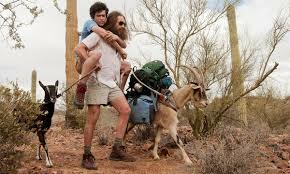 There is nothing Goat Man and Ellis like more than to take extended hikes with their goats, Freda and Lance and smoke large amounts of dope, so when Ellis makes the decision to leave Tucson and head to Gates Academy on the East Coast there are a lot of changes for everyone to adjust to.